The Central Library & Library System Headquarters of the Atlanta-Fulton Public Library System is home to an impressive Margaret Mitchell and Gone With the Wind collection. While the display isn't exactly museum quality, the artifacts totally are...a fantastic addition to the Gone With the Wind Trail. 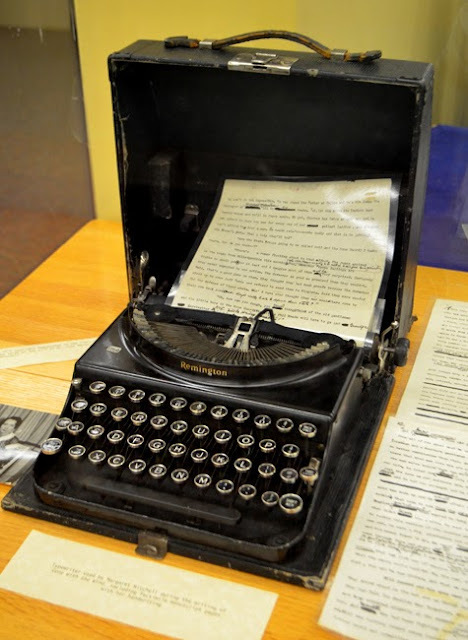 Among the attention-grabbing artifacts at the Central Library exhibition is the Remmington typewriter that Margaret Mitchell used to write Gone With the Wind. Even though I learned to type on a typewriter, it's ridiculously unfathomable that she type a novel as long as Gone With the Wind on a manual device! But then again, I suppose it was considerably quicker that writing it out by hand. We're so spoiled today! Okay, so to give you an idea of how extensive the collection is, Central Library has nearly 1,500 artifacts, including 73 editions of 35 translations of Gone With the Wind, as well as more than 500 of Margaret's personal books, many of which she used for research. And there are many, many other artifacts, some of which I'll share with you now. Of all the artifacts on display, the one that made me gasp, literally, is Margaret Mitchell's library card...her actual library card! And it looks like it got a great deal of use, which historical accounts confirm as factual. You'll see that the card says "Carnegie Library of Atlanta," which was the first public library in Atlanta opening in 1902. And it was a beautiful library. Unfortunately, it was demolished to make way for Central Library—this one—which opened in 1980. 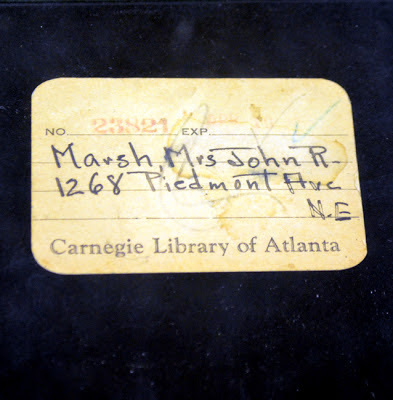 If you'd like to catch a glimpse of what's left of Margaret Mitchell's library—Carnegie Library of Atlanta—you won't have to go too far...it's walking distance for most. 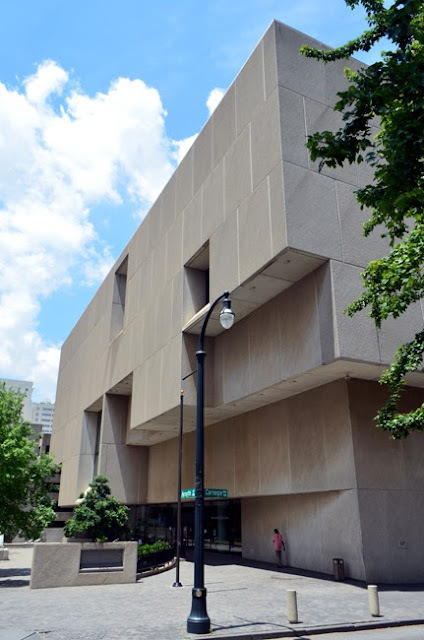 At the other end of Peachtree Street in Downtown Atlanta, where Peachtree Street and West Peachtree Street converge, and across the street from the SunTrust Plaza, there stands a memorial constructed from the facade and columns of the Carnegie Library. It's the "Carnegie Education Pavilion," a monument to higher education in Atlanta, and it bears the emblems of eight local higher education institutions. 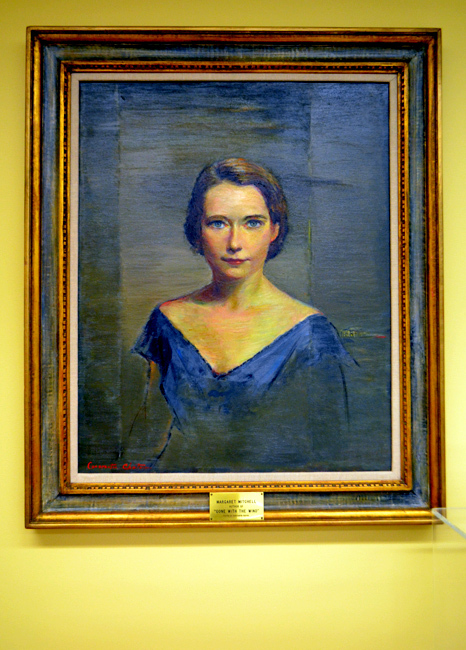 While a lot of Margaret Mitchell attractions have paintings of her, you're not always looking at the originals. This one (above) at Central Library is in fact original and it's rather extraordinary. This particular portrait was painted by Constantin Chatov (1904-1993), a Russian immigrant and concert pianist-turned-artist. He also painted portraits of Vivien Leigh and Clark Gable. One of the charming points of this painting is just behind her left shoulder, your right. Have a look. Yes...yes, that's Tara! Having served in the U.S. Navy, this next artifact I personally found ultra fascinating. Who else should commission the U.S.S. Atlanta (CL 104) other than the consummate Atlantan?! That's right, Margaret Mitchell christened the fourth ship to bear the name "USS Atlanta," and this is the christening bottle. That ship entered service in 1944 and served during World War II, and was eventually used for target practice and sunk in 1970. 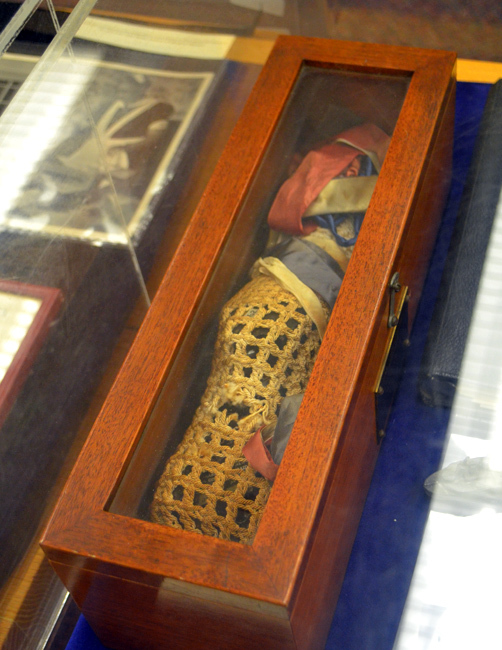 This whole display case features artifacts from that ceremony. 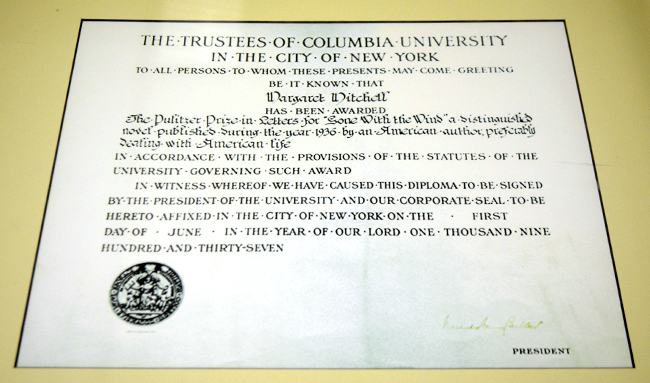 Among the prestigious artifacts in the Central Library collection are Margaret Mitchell's 1936 National Book Award and her 1937 Pulitzer Prize (above). See, I told you this is an impressive collection! And how cool to see a real Pulitzer Prize. So, not only does Central Library have this brilliant Margaret Mitchell collection, it's across the street from Margaret Mitchell Square, which is modest, but features abstract sculptures of the Carnegie Library (which I just realized as I'm writing this—you'll see what I'm talking about when you see the Carnegie Education Pavilion) within water features. It's been decades since I've been in an actual library. Visiting Central Library was a pleasant experience and quite refreshing to see so many people reading and researching...and reading...reading books! Real, paper books! When was the last time you saw that?! I love my technology—and would never give it up—but I do love cracking the cover of a paper book...there's no replacement for that. Does that make me sound nostalgic or just old? So, we're halfway through my Gone With the Wind Trail series. Come back tomorrow and Friday for writings about the final two of the five main destinations (and see the last couple of days for the first two writings), and I'll cover some others over the weekend. I hope you're having as much fun with this as I had researching it.